Happy Harriet Carter Wednesday! This week Harriet is covering her cans, her pets, and a little something special for her lap. Pervert. Let’s see what the Harriet Carter crapalog is forcing us to buy this week…. Product # 1 – Are you missing your legs AND your forehead? I know, me too. Well now you don’t have to obsess over how you’re going to throw away your soda cans because now as long as you have one workable arm (or even a rusty hook) you can crush as many cans as you want! Now this may just be me, but I suggest not installing this in your house. No, no! I say install this on the front of your house and head right outside as the homeless people are picking through your trash looking for some cans to collect to get money for. As they’re rummaging through your trash, just start crushing your cans and making them absolutely worthless to the homeless. Don’t forget to smile and wave as tears fill up their eyes…their dirty eyes. Trust me, it’s called tough love. They’ll be looking for work before you know it! Remember kids, “homeless” is a choice. God bless! Product # 2 – Do you have a fake cat? Does this fake cat appear to be a mix between a cartoon and a cardboard cutout? Does this fake cartoon cardboard cat “fake” crap all over the fake place? Well worry no more because now your fake cartoon cardboard cat can fake crap all over the fake kitty litter rug. Seriously, are they kidding me with this picture? Was there really no way that the crew at Harriet Carter could come up with a real cat for the photo shoot? Hell, I would have dressed up like a cat if that was easier. The cat in this picture is about the size of a coin as compared to the kitty litter box. Wait, are there midget cats? Maybe that’s it. Thanks Harriet! Next time spring for the real thing your cheap and heartless whore. 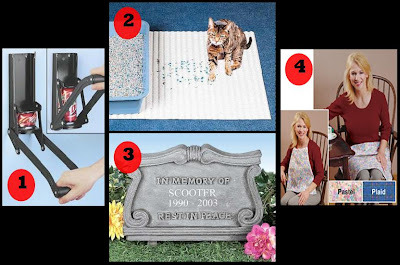 Product # 3 – Speaking of fake…poor Scooter. He was such a good dog. It really was sad to see him get hit by that bus (one would just assume). Why not honor man’s best friend with not only a fake and cheap tombstone, but apparently fake flowers, fake grass, and toss in the fake blue sky just for good measure! No joke, that’s the same grass that they put under the chair of the Easter Bunny when he visits your ghetto mall so your snotty screaming kids can sit on his lap and scream out what they want the Easter Molester to bring them. Oh well, rest in itchy and fake peace Scooter. I hope Scooter’s ghost isn’t allergic to plastic flowers. Product # 4 – Hey there you filthy slob! Having a hard time keeping 90% of your meal off your lap? Well now you can toss out that civilized dinner plate you’ve been using and go ahead and eat right out of a trough you nasty pig! Thanks to Harriet you can have a white-trash napkin that apparently also doubles as a blanket. Oh, and it comes in pretty pastel and even plaid! I can’t believe they would offer it in plaid. I mean, what am I the King of England? I have an idea on how you can save money. Don’t buy this. Instead, just slow down while you’re eating. The 6 pounds of meatloaf and potatoes that you’ve tossed on your plate will still be there in 10 minutes, fatty. I mean, God forbid you don’t shovel it in and take your time. Ok, well I feel better! Happy Harriet Carter Wednesday. Make sure you say that to every person you see today. When they ask what it means, just give them the finger. It’ll be our personal little secret. And if you tell anyone, I’ll kill your parents. Have a good daaaaay!